Click on any photo below to browse products from that category. Flat Grave Markers, as the name implies, are usually rectangular in shape and sit flush on the ground. They are among the simplest and more economical choices in memorialization; however, they can still be very personalized by choosing designs, fonts, symbols and pictures. 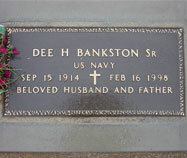 Most cemeteries regulate the size, and sometimes the color or design engraved on the marker. Cemeteries that have exclusive flat markers sections will require a flat marker for those sections. At Bell Memorials, we can assist you in determining the requirements of the cemetery you're working with. Pillow & Slant Markers sit on a concrete foundation or on a granite base. Pillow grave markers are similar to flat markers, but are 6-8 inches high, usually with a slightly slanted face created from having a higher back edge and shallow slope, and often sit on a base in the cemetery. 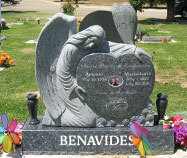 Pillowed gravestones can be customized with sizes, shapes, and designs. Slant headstones or "slanted memorials" have a serpentine top shape with a slanted face; the front, back and top are polished and the edges left as natural rock pitch. Slant markers are similar to an upright monument, but shorter and thicker; like uprights, they must sit on a foundation. 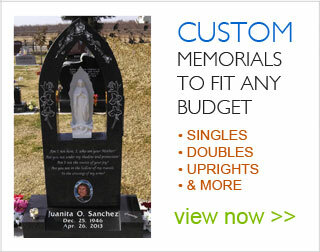 Slants offer many options for design placement and personalization and make a fine choice for memorialization. 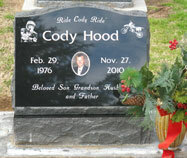 Upright Monuments are an excellent choice for unique, custom-engraved designs and personalization because they can vary greatly in size and shape, limited only by the cemetery's regulations. An upright marker is comprised of two or more pieces: an upright piece called a "tablet" and the lower piece, called a "base". Both pieces are then set on either a concrete or granite foundation. Baby Markers are used to memorialize infants and young children. The loss of a child is often the most painful thing a family can experience, and coping with the heartache can be overwhelming. Our staff is here to gently guide the survivors through this difficult time. While it can be challenging to express the enormity of a child's passing, our hope is that by helping the family come together to design a memorial, we can help them gain closure by creating a lasting memory. Bronze Memorials are cast of the highest quality bronze, then finished with a baked-on polyurethane coating to seal and protect, assuring they will look beautiful for years and years. Some of the latest innovations in bronze memorials allow for amazing detail, even utilizing your family photos and other icons of your loved one's life, fully customized and beautifully rendered. For public, commercial, and civic applications, bronze plaques make an ideal choice to commemorate donors, historical places, and important events. Pet Memorials - Honoring your cherished pet is a beautiful idea, and the perfect way to remember their love and loyalty with a permanent tribute. 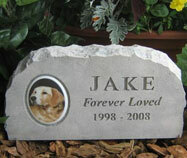 We offer several types of pet memorials to choose from: engraved river stones and garden rocks to granite markers. 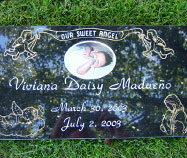 Granite pet memorials can be customized with photos and artwork of your choice. Granite Benches can be a lovely addition to a gravesite or garden, as a place to gather and spend quality time in remembrance. 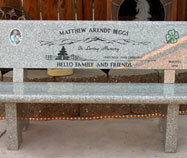 Benches can also be used as an alternative to a traditional headstone, or as a memorial for cremated ashes. Bell Memorials offers a wide selection of graveside benches, granite memorial benches, cremation benches, monubenches, bench headstones, gravestone benches, and cemetery bench monuments. A new innovation in cremation memorials is the cremation niche bench which encloses the cremation urn and can be placed in many serene settings, from cemeteries to backyard gardens. 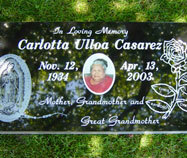 Granite Colors - Browse our selection of high quality granite colors for headstones, monuments and memorials. 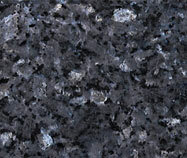 Our granite comes in many different colors, such as academy black, bahama blue, blue pearl, carnelian, cat eye, colonial rose, emerald green, georgia gray, india black, india red, light black, ocean green, paradiso, rainbow, sierra white, tan brown, and tropical green. Read what some of our clients have to say about Bell Memorials and Granite Works across the internet. 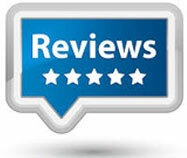 We have selected a small amount of our 5 star reviews. 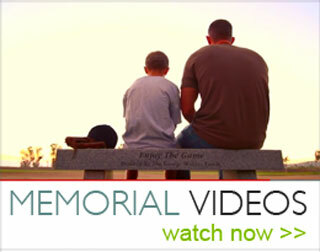 Click here to see why so many families have chosen Bell Memorials to design and create a beautiful, personalized memorial, that will capture family and friends for many generations to come.